Dr. Imelda Tan, PT, DPT, CES uses state-of-the-art treatment approaches to help patients in the Midtown East area of Manhattan and throughout the Greater New York City area understand the causes of their shoulder pain and receive the most effective and appropriate therapy to help them reduce painful symptoms while improving range of motion. 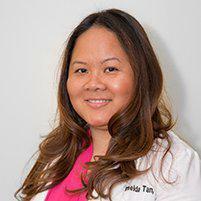 Imelda will perform a thorough evaluation of your symptoms to develop a course of therapy that will help reduce pain while developing strength and helping the shoulder regain range of motion. Frozen shoulder is a condition that occurs when tissues surrounding the joint become stiff and, often, scarred, resulting in pain, stiffness and limited range of motion when moving the shoulder or raising the arm. Frozen shoulder most often occurs following a period of immobility of the shoulder, such as following surgery, injury or disease like a stroke. Physical therapy following any of these occurrences can help prevent the development of frozen shoulder. The shoulder contains tiny pockets of fluid called bursa that help cushion the shoulder and facilitate pain-free movement. Bursa can become inflamed and irritate as a result of prolonged pressure on the joint or activities requiring repetitive motion. How does physical therapy help treat or prevent shoulder injuries? In shoulder treatment, physical therapy is aimed at reducing pain and inflammation while restoring strength and range of motion to the joint. Therapy is important following an injury to the shoulder, clavicle or arm or after surgery, and it can also be very helpful for people with arthritis or other chronic diseases that can increase the likelihood of shoulder pain or injury.